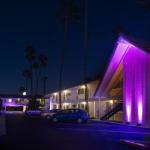 A convenient location along with two pools give our guests reason to choose the Vagabond Inn San Diego Mission Valley. The two-story hotel has 77 rooms with microwaves mini-fridges AM/FM clock radios and cable TV with HBO. Wi-Fi is available and local phone calls are free. Non-smoking rooms and in-room safes are available. Save time to relax in one of the two outdoor pools and the hot tub. The hotel provides fax services and parking. The hotel is just off I-8 in Mission Valley's Hotel Circle less than a mile from shopping and public transportation at Fashion Valley. Old Town San Diego is two miles from the hotel and SeaWorld and the San Diego Zoo are within four miles. Brush up on history at the Maritime Museum of San Diego or Mission Basilica San Diego De Alcala shop or dine in the Gaslamp Quarter hit the jogging or biking trails at Mission Bay Park or head for the surf at Ocean Beach all five miles away. The San Diego Convention Center Petco Park and Qualcomm Stadium are less than a 15-minute drive. San Diego International Airport is six miles from the hotel.